Vineyard I tapestry shows a lovely countryside scene of green vineyards. Here we see a countryside villa with a path leading towards it with gorgeous vineyards along the way. Baskets of purple grapes are seen, which echoes the beautiful violet color of the sky and clouds. The color palette is simply beautiful with the tones of greens and blues balancing the terracotta and browns beautifully. A lovely scene which celebrates life in the countryside. 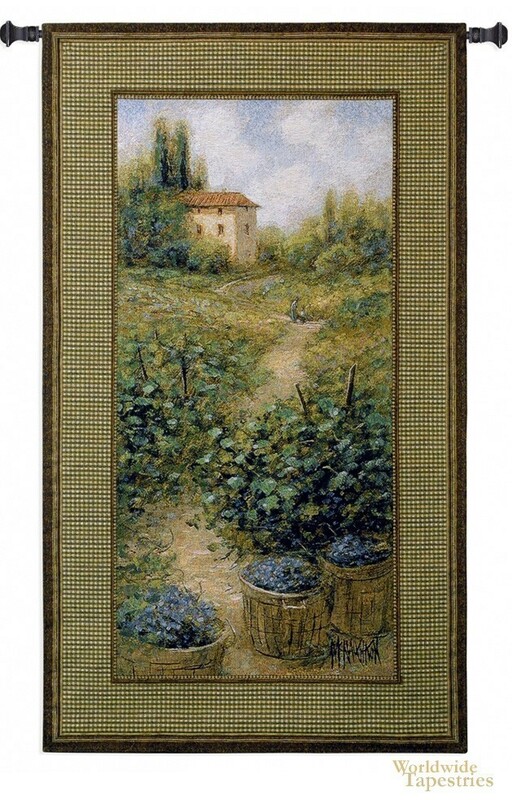 Vineyard I tapestry is backed with lining and tunnel for easy hanging. Note: tapestry rod, where pictured, are not included in the price. Dimensions: W 26" x H 45"